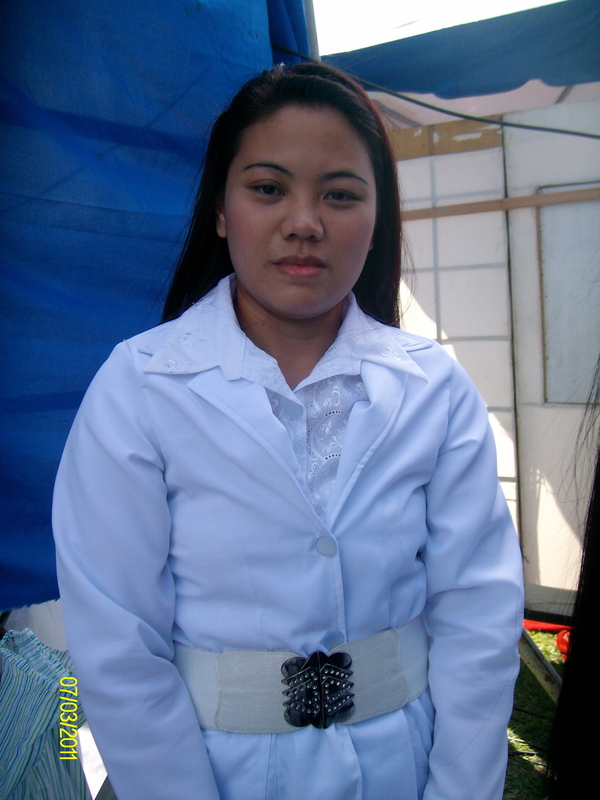 Sister Angie Letada at the Amoranto Stadium, Quezon City, Phils. Taken Feb, 2012. Sis. Angie begins her testimony being barely able to control herself from crying freely. She testifies that on January 7, 2012, Saturday, at 7:00 in the evening, while they were celebrating her beloved mother’s birthday, she went out to buy barbecue at a street corner near their house. While she was standing along the street near Heritage Homes in Marilao, Bulacan, a red, tinted van without a plate number suddenly came speeding by and two hooded men picked her up. They forcibly pushed her into the van. She fought with all her might until her clothes were ripped but she didn’t prevail. Inside the van, she saw three other women who were blindfolded, gagged, and their hands were tied behind them. As soon as she was inside the van, they also quickly blindfolded her and tied her hands behind her. They did not put a gag in her mouth. She felt the van was going in circles. Although she was so scared, she desperately asked for forgiveness for all her sins and shortcomings to her family and to the Lord and began singing praises to Him. (Many times during her testimony, Sis. Angie would burst into tears just remembering the trauma she had gone through). She testifies that they took their watches and other belongings. One of the kidnappers declared that they were going to kill them all because they couldn’t get anything of value from them. Sis. Angie continued to sing praises to the Lord much more desperately. At 4:00 in the morning, she was praising relentlessly, proclaiming the name of the Lord Jesus Christ. She completely surrendered her life to His keeping. Then, the driver of the van ordered his companions to release the one in white (Sis. Angie was the only one wearing white among the victims). Sis. Angie continued to pray feverishly, begging the Lord to save her and let her live and she vowed that she will serve Him all her life. She also begged the kidnappers not to hurt her, telling them she has two little kids. One of the kidnappers took her slippers telling her that he would give them to his wife. Sis. Angie answered that they could take everything as long as they wouldn’t hurt her. She could feel the Lord Jesus just standing by her side. The kidnappers dropped her off at around 4:00 in the morning. It was dark and raining, and she didn’t know where she was. The place was like a forest and she couldn’t recognize it at all. She was barefoot. Surprisingly, she found 100 pesos somewhere in her pocket. She remembered her beloved husband giving her the money. She was so thankful to the Lord for this. She used the money for fare. Then, she met an old woman who let her use her cell phone. She was able to contact her beloved mother. Her family finally found her at Tabang Exit in Bulacan. Later, they heard in the news that there were three women found dead in Balagtas, Bulacan. Sis. Angie didn’t want to think that these were the three women that were with her inside the van, but she was just so overwhelmingly thankful to the Lord Jesus for His GOODNESS! Balagtas is near Tabang Exit where she was found. And it was in Balagtas that the three bodies of women were thrown. Sis. Angie almost couldn’t believe the miracle that happened to her – that she was delivered by the Lord from the certainty of death and she was brought home safe. HALLELUIAH! THE HIGHEST PRAISES TO OUR LORD JESUS CHRIST! TO GOD BE ALL THE GLORY!! !